Sagamihara Asamizo Park (相模原麻溝公園) is located in Sagamihara, Kanagawa. It has a huge play ground, kids facilities, flower garden, sports field and free public zoo. It is also famous for its Hydrangea. 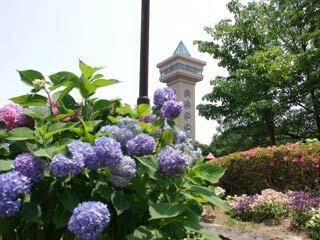 Asamizo Park has about 170 kinds 6,000 Hydrangea, and they bloom in June. At the observatory which as 38m high, you can see a great view of Sagami area. There is parking. Closed at 20:00. It is a popular Ajisai spot in Kanagawa Prefecture. The public zoo has great collection of animals and birds. Also, you can enjoy pony riding. In some area, dogs are not allowed.